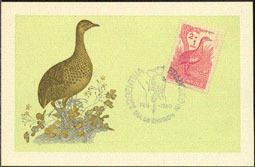 3526 MAX ARGENTINA (1960) Rufous tinamou*. Maximum card with illustrated First Day cancel. Scott No CB17, Yvert No PA65.